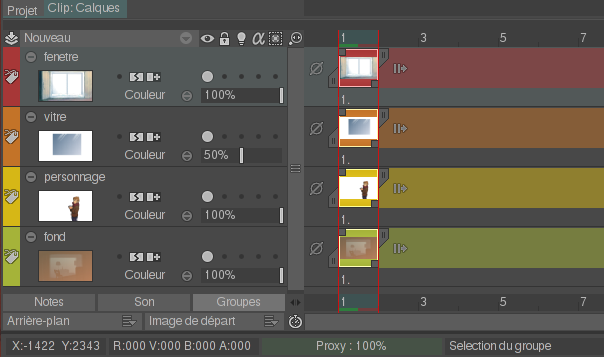 In TVPaint Animation, you have the possibility to organize your layers by using pre-defined group. By assigning the same Color group to several layers, it will be easier to globally work on them. Click on the icon in the first column of the timeline to modify the group where you will put your layer. - On the bottom left corner of your Timeline, you will note a Color Group button. 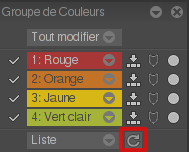 By clicking on it, you will open the Color Group panel, as shown below. You can also open it via the Windows > Show > Color Group main menu. When you first open it, there will only be these third lines displayed. If you assigned colors just like the previous example, the Refresh ( ) button will let you display the groups currently used in your project. 0: Default has disappeared because we have given another color to our layer.